Public administrators typically work within government agencies or nonprofit organizations and provide valuable services to their communities. A career in public administration may involve managing programs, people, and budgets, and professionals are often involved in the development and implementation of legislation and policies surrounding education, criminal justice, and economic growth. Job opportunities in this field are abundant, and many graduates of public administration programs go on to become research analysts, government aides, city managers, political scientists, and program managers. The industry is expected to grow in coming years, and an increasing number of colleges and universities are now offering degree programs for a bachelor's or master's in public administration online, making this career path an attractive one for working students looking to enhance their skills and knowledge. The average salary in the field of public administration increases with the higher level of degree earned. Individuals with more advanced degrees are also able to explore a broader variety of career options. Many public administration jobs are available to those with a BPA alone, while earning an MPA online (achievable with an additional two-year commitment at a comparable cost to the BPA) provides the tools needed for public administrators to advance to upper-level management positions and an average $6,500 salary increase. With a time commitment of two years and an average cost of $9,979, an associate in public administration degree is an affordable option for students interested in exploring the field. Aspiring professionals who earn an associate degree in public administration will be prepared to perform the functions required for entry-level careers with nonprofit organizations as well as local and state governments. APA programs cover the fundamentals of accounting, organizational management, and problem-solving, and students develop the foundational skillset required to run a department, group of staff, and to continue their education with an online BPA or online MPA. A bachelor's of public administration degree provides students with training in public policy and management. Earning a BPA typically involves a time commitment of four years at a university and an average tuition cost of $17,448. During these four years, students gain a background in fields like economics, management, and political science. Students who earn their BPA either online or in the classroom are able to enter a wide variety of occupations in local levels of government, national or federal levels of government, or in the nonprofit sector. Many students also opt to further their education by pursuing a master's in public administration online. At an average cost of $18,840 and a time commitment of two years, students may be interested in pursuing an in-class or online MPA after the completion of their bachelor's degree. Degree curriculum builds upon the skills and knowledge developed in the first four years of a student's education. Many schools offer an online master's in public administration, allowing students the flexibility to advance their career at their own pace. Online MPA programs and MPA programs in the classroom both provide students with practical skills and training required for upper-level managerial positions. For the 2016 rankings, OnlineColleges.net has greatly refined its approach to evaluating schools and their respective programs. Our innovative method of assessing schools is what makes our rankings so distinctly authoritative. On the surface, every ranking we produce employs a basic formula: Academic Quality + Online Offerings + Cost and Student Aid = Final Score. This final score determines where a school ends up in our rankings. Of course, there's a lot more than meets the eye. Visit our methodology page to discover the data points that shape our formula and to learn more about our process. Northwestern University offers an online MPA with optional specializations that include public administration, public policy, global policy, and global health. The program can be completed in two to three years of uninterrupted part-time study (with a student enrolled in one or two classes per quarter), although students are allowed five years to finish the program. This degree combines the analytical and administrative sides of the discipline into a single program. Although the curriculum varies according to specialization, all core coursework encourages interdisciplinary study and incorporates a global perspective into policy and planning. Distance learners have the option of completing a final thesis or a culminating capstone project, which can be undertaken individually or as part of a cohort group. Online courses are accessible through the Canvas learning management system. The University of North Carolina at Chapel Hill offers an online MPA that focuses on a broad curriculum to prepare students for careers in government and nonprofit agencies. The program combines rigorous online coursework with practical experiences, including 10 weeks of full-time employment in a public or nonprofit organization as part of a professional learning requirement. Online MPA students are also required to develop a professional portfolio during their time at UNC and pass a final oral examination. Research assistantships and scholarships are available to top MPA candidates. Online courses are accessible through the Sakai platform, with additional classes available through the school's partnership with the MOOC open course system. UNC serves more than 90,000 students in more than 300 online programs through its technology-based learning and innovation office. The University of Southern California offers an online master's in public administration. The online MPA at USC combines research and practice to emphasize policy-making, managerial, and analytical skills to prepare graduates for socioeconomic and political careers. Courses may be delivered synchronously or asynchronously through lynda.com. USC's distance learners can obtain comprehensive library access, career counseling, and web assistance services, as well as the opportunity to enroll in USC health insurance plans. The program is completed over five or six semesters, including summer terms. The online MPA program offers rolling admission, with start dates in fall, spring, and summer semesters. USC's public policy school has earned numerous distinctions from U.S. News & World Report for its online MPA and other graduate programs. Johns Hopkins University offers a master's in public administration online with focuses on interdisciplinary governmental and nonprofit studies in security, analytics, and intelligence, among others. The master's of arts in public management comprises 12 courses spanning four semesters. The program also includes a capstone project. All online students must complete an orientation course in Blackboard before beginning coursework in their major. Johns Hopkins' online courses are taught asynchronously and delivered through a variety of multimedia channels. Students requiring additional assistance can sign up for Skype meetings during their professor's office hours. Support services for distance learners include tech support, career counseling services, and complimentary stress management through the Johns Hopkins student assistance program. The university also offers full electronic library access and research tools. California State University offers an online MPA through its Long Beach location. Hosted by Cal State's public policy and administration graduate center and its continuing and professional education college, the accelerated master's of public administration emphasizes broad management skills for community-oriented and nonprofit leadership roles. Students are required to participate in a synchronous webcast lecture with the course instructor one night each week; this is hosted using Elluminate software. The remaining coursework is delivered asynchronously through the Blackboard LMS. In addition to lecture-based classes, the online MPA includes a directed research project. Completion of a student learning portfolio is also required. Although the majority of the program is carried out online, distance students must attend one face-to-face session on the CSULB campus. U.S. News & World Report has recognized CSULB as one of the top universities in the West. Located in Washington D.C., American University offers an online master's of public administration and policy. This program combines the skills and focuses of AU's world-renowned MPA and MPP programs. In 2015, this online master's in public administration was ranked among the top five programs of its kind in the nation by U.S. News & World Report. Courses are accessible through the Engage online system, which provides a weekly-deadline-driven learning schedule. Distance learners can also use Engage to access student resources and live-streams. Students may enroll during the fall, spring, or summer semesters. Full-time students can complete the program in as little as 24 months. During the final semester, candidates have the opportunity to develop a culminating capstone project for a real client in a public or nonprofit sector of business and administration. Indiana University offers an online master's in public administration that combines elements of its master's in public policy and master's in public administration degrees. Coursework is designed to prepare students for careers in public service through the study of analytical, managerial, fiscal, and legal topics. Graduate certificates are also offered online through IU's public and environmental affairs school. Coursework is accessible through the Canvas platform, which also provides support services including IT help and virtual tutoring. In addition to traditional coursework, the master's of public administration requires students to participate in an internship, research project, employment credit, or volunteer experience. Students with prior work experience may be eligible to waive the experiential component requirement. Online students must also complete a culminating capstone course during their final semester. Barry University offers an online master's in public administration. This is a professional development program aimed at adult learners who are interested in becoming administrators at public and not-for-profit organizations. Coursework is centered on finding solutions to socioeconomic, ethical, and environmental issues that affect the modern world. Online classes are accessible through the Canvas learning management system. The professional and career education division of Barry University provides distance learners with access to library services, tutoring, and writing labs. Online students must also complete a capstone project. Applicants who do not have a BPA or similar degree may be accepted but are required to take a graduate-level introductory course in public administration. Barry University is also one of the 19 Independent Colleges & Universities of Florida to participate in the Yellow Ribbon Program, which helps U.S. veterans afford college tuition. The University of Colorado Denver's Anschutz Medical Campus offers an online MPA that is designed for entry- or mid-level public service professionals. The university's public affairs school is the only accredited graduate school of its kind in the state of Colorado. Distance learners can choose concentrations in nonprofit management or homeland defense; additional concentrations are available to on-campus students. Courses are accessible through the Blackboard platform. CU Online's student portal provides support in the form of library access and virtual tutoring. This online program requires a two-semester thesis or capstone project with a real-life client. Students with no prior work experience are also required to complete a three-credit internship course in addition to the core requirements. 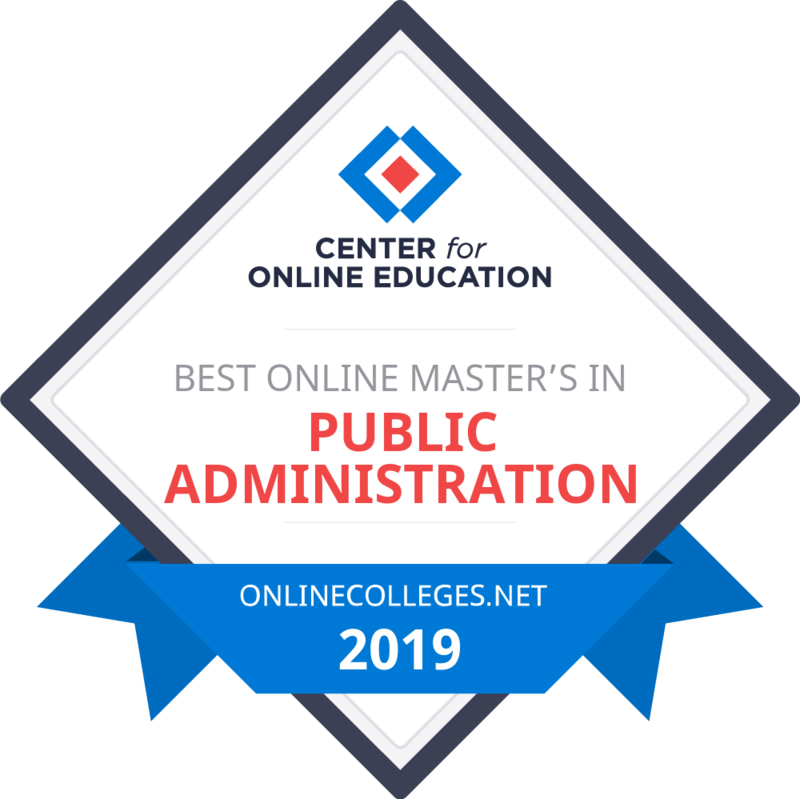 CU's master's of public administration has been consistently recognized as one of the best online MPAs by U.S. News & World Report. The University of Baltimore offers an online master's in public administration with a specialization in public and nonprofit management. Courses are accessible through Sakai, and student support -- including tutoring, peer coaching, and online workshops -- is provided by the school's achievement and learning center. A three-credit internship is optional for those with prior work experience but is mandatory for students with no professional training in the public sector. UB's public affairs college also offers a dual JD/MPA degree for students who want to apply both legal and managerial skills to a public service career; applicants into the dual-degree program must meet admissions requirements for both the law school and the MPA program. Students can apply to enroll in this program during the fall, spring, and summer semesters. DePaul University offers an online MPA with three distance-only specializations: metropolitan planning and urban affairs, international public management, and public management. The MPA program may also be expanded to include select graduate certificates, including certificates in community development and metro planning and development. Online courses are accessible through the D2L platform, with additional support provided through virtual tutoring, mentoring, and advanced technical assistance. Applicants are expected to have at least 12 consecutive months of professional experience in a government setting in order to waive the work experience component of the degree; students without such experience are required to complete an internship in addition to the foundational major requirements. As a capstone project, students participate in an integrative seminar to complete an active research project that integrates applied research and theoretical frameworks. California State University offers an online MPA through its Northridge location. It is the leading provider of MPA degrees in California and the third largest provider in the U.S. Students may choose concentrations in health administration, nonprofit sector management, or public sector management and leadership. Coursework in the online MPA program incorporates a global focus while drawing inspiration from the program's partnerships with more than 20 local government agencies. Online courses are accessible through Moodle, and students have access to extensive online orientation training and comprehensive technical assistance. The master's of public administration program concludes with a seminar course and a graduate project, which serves as a comprehensive exam. CSUN's online programs are designed for student cohort groups, incorporating a sense of community and collaboration into the learning process. San Diego State University offers an online master's of public administration through an accelerated 16-month program. SDSU has awarded MPA degrees for more than 50 years, and the program was recently ranked number one among California State University schools and fifth best in the state of California by U.S. News & World Report. Online courses are accessible through Blackboard and student support is available in the form of virtual advisors, financial aid staff, and an online help desk. The online master's in public administration includes two-month modules of core and elective courses, which are completed by a student cohort group. Students choose the topic of their culminating capstone project according to their interests; these topics include urban government administration or nonprofit relations and government. In addition to online coursework, students must complete two on-campus courses in order to earn their degree: one course at the beginning of the program and one at the end. The University of San Francisco offers a master's in public administration online with a focus on experiential learning; this program is set within the framework of Jesuit values and principles. It generally takes students six terms, or two years, to complete this program. Curriculum includes two eight-week courses per term, culminating in a capstone project during the final semester. Courses are delivered asynchronously through Blackboard and include webinars, tutorials, and orientation courses to help students acclimate to online learning. The program features numerous start dates throughout the year during the fall, spring, and summer terms. Although applicants are not required to declare a concentration, coursework is rooted in five key concepts including strategic planning and partnership-building. Online students are invited to visit the Bay Area and attend commencement exercises on-campus with their graduating class. Texas A&M University-College Station offers an online MPA with optional tracks in homeland security, nonprofit management, and public management. Students seeking admission into this program must have at least five years of professional experience. All students are required to complete a culminating capstone project with a real-life government agency or nonprofit organization. Distance learners must also attend a one-week residency on campus during each summer semester, totaling two residencies during the course of the program. Courses in this online MPA program are taught asynchronously. Comprehensive support resources are available through the distance learning division of Texas A&M, including virtual counseling, veterans support, and technical assistance 24/7. According to U.S. News & World Report, the university ranks among the top 15 public management and administration programs in the nation. The University of Illinois at Springfield offers an online master's in public administration. This degree teaches students about organization dynamics, budget and finance, and human resource management. Students can customize their education by choosing from a variety of electives, such as administrative law management, capital budgeting, and labor arbitration and dispute resolution. The master's of public administration also includes a capstone seminar as a final requirement, which is completed during the last semester. Online courses are accessible through the Blackboard learning management system. Distance learners have access to an online library, bookstore, and billpay financial services. The university's public administration department also offers a joint MPA/MPH degree, as well as online graduate certificates in management of nonprofit organizations and community planning. Students may enroll during the fall or spring semesters. The John Jay College of Criminal Justice, which was established in 1964 as a component institution of the City University of New York, offers an online MPA in four optional specializations: criminal justice policy and administration, emergency management, human resources management, and management and operations. The master's of public administration: public policy and administration program can be completed in as little as two years. Courses are accessible asynchronously through Blackboard, and distance learners benefit from a variety of student support resources including career counseling, tech support, and a strong alumni network. Curriculum encompasses core and specialization courses, culminating in a capstone seminar in the last semester of study. After completing the public administration foundations course, students must also pass a qualifying examination before completing this program. The University of Central Florida offers a dual master's of public administration/master's of science in criminal justice degree, which awards two separate diplomas. Online courses are accessible through the Blackboard learning management system. Distance learners have access to comprehensive student support resources including software and skills training, tech support, and enrollment and academic advising. UCF also offers its own mobile app to help online students. This non-thesis program combines traditional core classes with a variety of research methods, statistics, and electives, culminating in a capstone project. While core curriculum includes foundational courses in both areas of study, optional electives are mostly selected from criminal justice topics. These include foundations of law enforcement, juvenile justice, and law and social control. The program offers fall and spring enrollment options. The University of Texas offers a master's in public administration online through its Rio Grande Valley campus location. The master's of public affairs is designed to incorporate public policy, governmental studies, research, and nonprofit management skills into a unique interdisciplinary program for public service professionals at all levels. Classes in this program are each seven weeks long, and they are accessible through the Blackboard learning management system. The university's innovative MyUTRGV site acts as a one-stop student portal for tech support, academic advising, and electronic library services. This site also provides students with access to their student email accounts, financial aid statements, and interactive calendars and schedules. Students are required to undertake a capstone project in public administration to finish the program. Full-time students can complete this online MPA program in as little as 12 months. Valdosta State University offers an online MPA in two concentrations: public policy and public sector management. The program also offers a third concentration in public sector human resource management in-person at its Moody Air Force Base campus. The master's of public administration is an accelerated, non-thesis degree. Courses are accessible through D2L with the aid of the BlazeVIEW learning management system. VSU's student portal provides support through online library access, an IT help desk, and a full-service student account center. While the majority of coursework can be completed online, distance students are required to complete an internship of at least 300 hours as a participant-observer within a government agency or nonprofit organization near their residence. Distance learners are afforded in-state tuition rates, regardless of their physical location. Central Michigan University offers an online MPA in one of 14 concentrations, including acquisitions administration, recreation and park administration, and information resource management. Online coursework in the master's of science in administration program is accessible through Blackboard. The CMU student portal offers a variety of resources for distance learning, including live chat tech support, tutorials, and Webinar training. CMU also employs a generous credit-transfer policy for prior learning experiences, which allows graduate students to transfer up to 10 credits into its online MPA program. The degree culminates in a capstone course and a research review project. Full-time students typically graduate in two years. Distance learners pay the same flat rate for tuition, regardless of their state of residence, and discounts are available for active-military and veteran students. Lindenwood University offers a master's in public administration online through a unique interdisciplinary program that combines government operations, business administration, and human services competencies. All required and elective courses in this program are available online. Classes are accessible through the Canvas learning management system, and additional support is provided through career counseling, online library access, and virtual tutoring services. Although candidates for this online MPA are not required to declare a concentration, they can pick electives from a variety of topics including data collection and evaluation, policy design and analysis, and legal issues in public administration. Students must also complete a culminating capstone experience to earn their degree. The MPA program operates on a five-term calendar, allowing students to finish in less than two years. The University of Missouri offers an online MPA that teaches students how to collaborate across the public, private, and nonprofit sectors. Courses in this program are nine weeks long; students typically take one class during each session and finish the program in two years. There are five application dates each year and GRE scores are not required to apply. Online courses are accessible through the Blackboard learning management system, and distance learners have a variety of support resources including enrollment advisors and electronic library access. Online students must also complete a strategic management course to meet the core requirements of this program. Graduate certificates in grantsmanship, organizational consulting and change, nonprofit management, and public management are also offered. MU's distance learners enjoy in-state tuition rates, regardless of their state of residency. Although its main campus is located in Boston, Northeastern University also offers many online degree programs, including a master's in public administration. This online MPA provides a foundation in practice-based learning and emphasizes research-intensive graduate coursework. A range of unique elective courses are also available, including urban revitalization and mental health policy analysis and administration. Students are also required to complete a capstone seminar in public policy and public management. Enrollees who do not have any previous professional experience in the field of public administration must carry out a 300-hour internship in regional and urban policy, in addition to core requirements. Courses are taught asynchronously through Blackboard, and distance learners have access to additional support through Smarthinking tutoring, virtual advising options, and time-management training. Full-time students typically complete this program in two years. Troy University offers a master's in public administration online in seven concentrations: public management, government contracting, justice administration, public health administration, nonprofit management, public human resource management, and national security affairs. Students may select up to two concentrations. The program is comprised of 12 core and elective courses, culminating in a capstone project in public administration. Troy University delivers online courses through Blackboard and the eTroy student portal, which offers online support in the form of a writing center, tutoring, virtual counseling, and career exploration services. Although the majority of coursework can be completed online, students without at least one year of professional experience must complete an internship to satisfy core requirements. This degree can be completed in as little as 15 months. The average cost and time commitment required to earn a doctorate degree in public administration varies depending on the institution. Like online MPA programs, many DPA programs are offered online and provide a flexible schedule for working and full-time students. Earning a doctorate in public administration often involves a research-based curriculum, requiring the completion of a dissertation and enrollment in advanced courses. Upon the completion of a DPA program, individuals are prepared to compete in the job market for leadership positions in government agencies, politics, or in public service organizations. Explore accredited online colleges with our comprehensive database of online programs. Sort the results based on criteria like degree level and location. Many organizations and companies employ public relations managers to help create and maintain a favorable public image. City public relations managers work within a municipality to moderate between the local government and the community it serves by informing the public about the activities of government officials and agencies. Completing a master's in public administration online better prepares prospective employees for the requirements of this managerial position. Specific duties of a city public relations manager may include writing press releases, drafting and arranging speeches, and responding to requests from the media. Individuals who possess organizational skills, excellent speaking and written communication skills, and who enjoy dealing with the public are ideal candidates for this occupation. Public safety directors are employed by a city or county to work within a local government jurisdiction. The most important functions performed by public safety directors include the coordination and supervision of services provided to protect the citizens of their given jurisdiction. Public safety directors oversee and implement public safety budgets, procedural policies, and professional conduct codes. These duties involve close work with police departments, fire departments, emergency medical services, and animal control services. Flexible individuals with excellent organizational skills, problem solving skills, and analytical skills are ideal for this position, although related work experience in public safety is also typically required in order to be considered for employment. Mayors are chief executive officers in charge of local governments rather than companies. Duties of a mayor include management, negotiation, and establishment and implementation of policies and procedures. Additionally, mayors oversee local programs, budgets, events and activities, and the use of resources within their city. Mayors must be elected to their position by the public they intend to serve. Prior experience in public administration and the completion of an MPA online or on-campus program can be invaluable for those seeking a political career path. Individuals with excellent social skills, problem solving skills, and leadership skills are ideal for a mayoral position. Administrative directors plan, manage, coordinate, and direct the supportive services of an organization. Specific duties vary from one organization to another, but it is typical for administrative directors to assist with maintaining facilities and supervising the supportive services of an organization, such as recordkeeping, mail distribution, and office upkeep. Detail-oriented people with analytical skills, communication skills, and leadership skills are ideal candidates for administrative director roles. While a bachelor's degree is often all the education one requires to land this job, individuals seeking advancement in this field benefit greatly from the completion of an online master's in public administration. Public administrators must be flexible and prepared to perform a variety of roles in their workplace. Specific job functions vary from one position to the next and are determined by the needs of the organization or company they work for. In general, public administrators are placed in important leadership roles overseeing, implementing, and evaluating programs, public policy, and services within an organization or government body. Individuals who have completed on-campus or online MPA programs earn higher salaries in this field. A slight decline in job growth is projected due to the limited number of higher level administration service management jobs available, however, an increased number of retirements in upcoming years is expected to create more job openings. Students pursuing a public administration degree can further advance their professional skills and career prospects by earning certification. While there are no certifications specifically catered to those in the public administration field, there are several related certifications available which individuals may consider applicable to their overall career goals. The Certified Public Manager (CPM) program is a nationally accredited leadership development program which consists of classroom instruction, at-home assignments, application projects, and examinations. Specific application requirements and scheduling vary from program to program, but all require a minimum of 300 hours of training in order to enhance students' leadership skills, personal effectiveness, and to promote the creation of innovative solutions in the public administration field. As an added incentive, CPM participants may also be able to earn credit toward an MPA online program or other college degree plan for their completion of the program. Formed in 1939, the American Society for Public Administration (ASPA) is the largest professional association for public administrators. The ASPA offers varying levels of paid memberships, including memberships designed specifically for students, new professionals, or seasoned professionals, whether in the United States or abroad. Through the Chapters and Sections of the association, ASPA members are given the opportunity to become involved in local public administration communities, attend conferences, participate in professional development activities, and receive exclusive publications on public administration throughout the year. The benefits of an ASPA membership provide the keys to efficient networking and career advancement.